The following report comes from the Israel Antiquities Authority. Rather than indent it, I am leaving it full width for ease of reading. 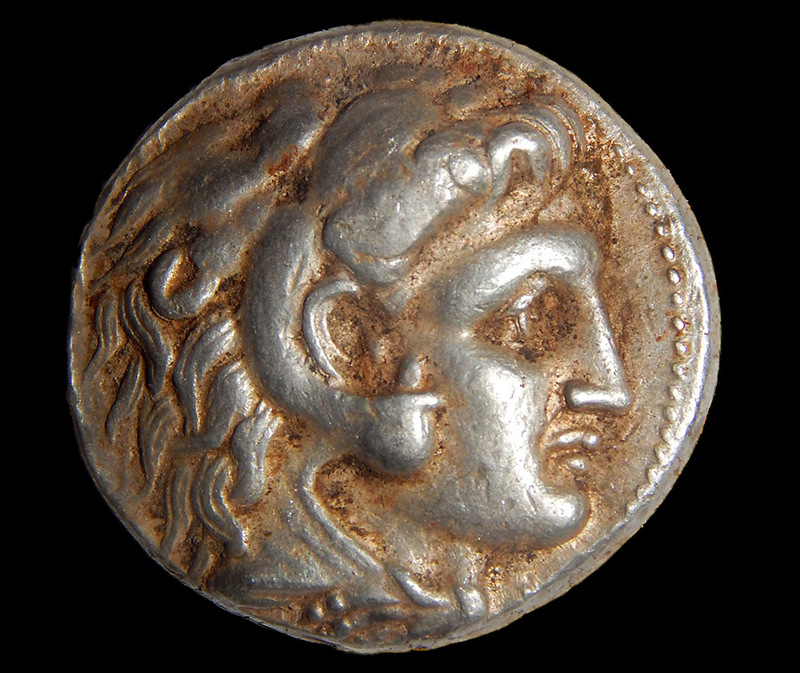 A coin of Alexander of Macedon that was part of the silver cache. Photographic credit: Shmuel Magal, courtesy of the Israel Antiquities Authority. 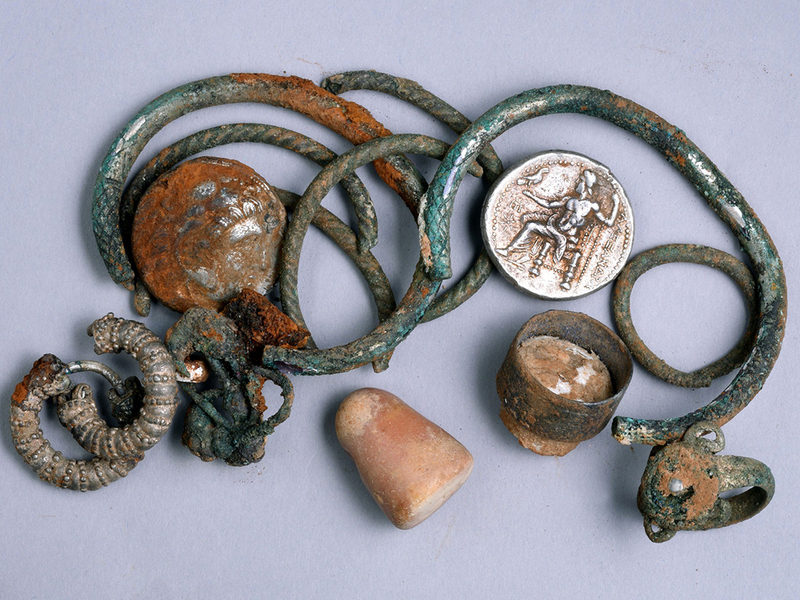 A general picture of the cache of silver objects: two coins of Alexander of Macedon, three rings, four bracelets, two decorated earrings, three other earrings (probably made of silver) and a small stone weight. Photographic credit: Clara Amit, courtesy of the Israel Antiquities Authority. Amir Ganor, director of the Unit for the Prevention of Antiquities Robbery in the Israel Antiquities Authority wants to commend the three members of the caving club, “They understood the importance of the archaeological discovery and exhibited exemplary civic behavior by immediately bringing these impressive archaeological finds to the attention of the IAA. After the gold treasure from Caesarea, this is the second time in the past month that citizens have reported significant archeological finds and we welcome this important trend. Thanks to these citizens’ awareness, researchers at the Israel Antiquities Authority will be able to expand the existing archaeological knowledge about the development of society and culture in the Land of Israel in antiquity “. The Israel Antiquities Authority wishes to emphasize that the Law of Antiquities states that all antiquities belong to the state, and that failure to report or removing antiquities from their location, or selling or trading them is an offense punishable by up to five years imprisonment. Officials in the Israel Antiquities Authority want the location of the cave to remain secret because of the many hazards inside it. Apart from the concern that the archaeological strata and stalactites might be damaged, there is a real danger to visitors to the cave because there are hidden and extremely deep underground cavities in it through which one might fall. In addition, the Israel Antiquities Authority wishes to stress that crawling in caves is dangerous and requires appropriate training and safety equipment. You may locate a copy of this release, along with some other photos, here. More photos have been published in the Daily Mail here. I have seen articles about this in several Israeli papers yesterday and today. Thanks to Joseph I. Lauer for the IAA press release. This entry was posted in Archaeology, Bible Lands, Israel, Photography, Travel and tagged Alexander the Great, Israel Antiquities Authority, numismatics. Bookmark the permalink.